You will feel right at home in our Dive Center. We offer a few essential items for sale, complimentary tea and coffee facilities as well as reasonably priced specialty coffee for surface intervals. A large collection of reference books specific to muck diving, diving North Sulawesi and diving Indonesia is available to help you identify critters. A full range of high-quality dive equipment (AquaLung, Suunto, Intova and others) is available for rent. Additionally, you can rent a torch/flashlight for a night dive, or a special U/V light for viewing luminescent critters and coral – a must-try if you have never seen this before! 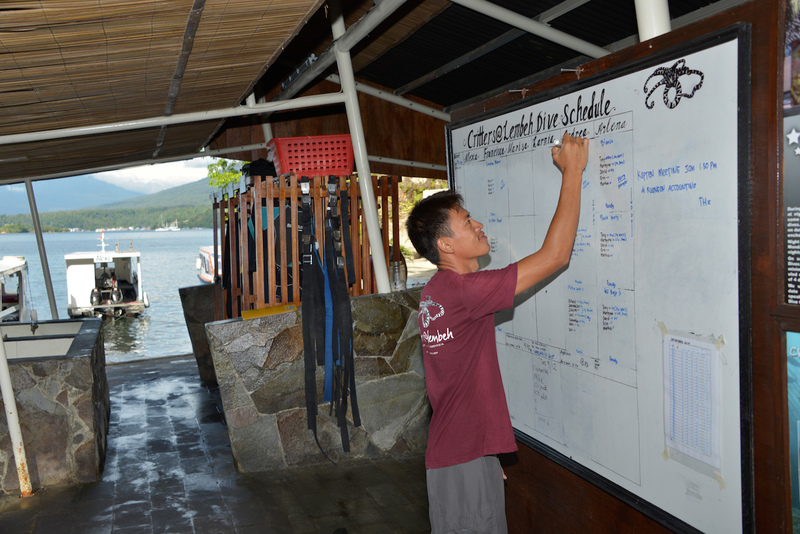 What to do between dives in Lembeh Strait? We invite you to visit the Genus Bar just next to the Dive Center, where you can relax in or out of your wetsuit, enjoy a complementary tea or coffee, or purchase a barista beverage (cappuccinos, espressos, iced mochas….you name it! ), and peruse our library of dive magazines and identification books. Our professional guides and in-house marine biologist will happily join you and help identify those critters captured in pixels. It’s also a great place for admiring your fellow divers’ photos or exchanging photography tips. Our new dive preparation area has just been unveiled! Each diver has their own spacious, personal locker area with drying pegs for boots and hangers for suits and BCs. There are long benches for kitting-up and a briefing area with big whiteboards to help you plan your diving program and keep an eye on the day’s events. Before your first dive of the day, your gear will be loaded onto the boat and assembled ready to use. You just do a quick check. After your last dive of the day, our team will see that your equipment is carried, rinsed with fresh water, and properly stored. Wetsuits are washed in special soap every two or three days or on request, and after the last dive of your trip. There are dedicated rinse tanks for cameras, dive gear and wetsuits. Our boat crews and dive guides will treat your dive and camera gear with the utmost respect it deserves. Our spacious camera room is just steps away from the boats and is the perfect place to keep, organize and set up your camera, housing and photography accessories. Private workstations with power plugs (both 110V and 220V) are available for everyone and just outside, there are rinse tanks and air guns for blasting water off your housing after rinsing. All our dive boats are custom-built with divers’ comfort and convenience in mind. There are ample padded areas for your camera and hooks and storage areas for your dive accessories. Our boats are all covered for protection from the sun, and have a toilet, emergency oxygen, first aid kits and lifejackets. Our staff is trained every year in CPR, first aid and emergency rescue procedures.Our boats are fully equipped with spare tanks and spare dive equipment as well as towels, drinking water, fresh fruit and candies. For double-dives we also have hot water for coffee or tea as well as snacks and biscuits. Dive briefings take place on the boat and we use our famous Critter Log, a book of laminated photos, to show you what you may see on your dive. It’s also fun to consult the Critter Log after the dive and compare notes with your buddies on what you saw. Quality of gas is essential for a safe and enjoyable dive vacation. Our Compressor Team works with a brand new, state-of-the-art membrane Nitrox compressor and multiple air compressors with the best filter system available to ensure you have nothing but the best in each and every tank. • Self guided house reef dives are available any time. We follow a policy of “Dive As You Like”. Today you may take three boat dives during the day, while tomorrow you may prefer two morning dives with a house reef dive and a night dive. When you want to dive, where you want to dive and what you like to see is what we our dive center aims to provide. Just ask, we’re flexible! 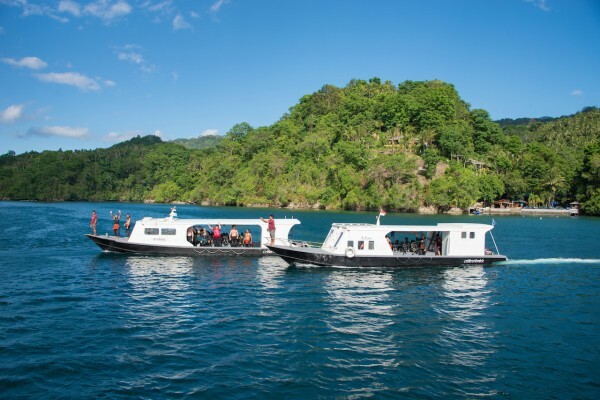 Our dive center has an optimal location in the middle of Lembeh Strait (view our location in relation to the dive sites or our location on Google Maps) and about 35 sites are accessible by boat in 15 minutes or less. This allows us to easily come back to the resort between the first and second dive. This gives you the opportunity to charge batteries or lights, enjoy a cup of barista coffee at our Genus Bar while showing off your latest photos, or work on your tan at our seaside sun deck. It also means if you are a night owl and feel like skipping the first dive and doing a night dive instead, you needn’t skip both morning dives.